Deep in the Everglades a cowboy is murdered for his opening credits, several years pass, and a college archeology professor along with his students are investigating the same area. A man sent ahead to set-up camp has vanished, the local Seminole guide wants nothing to do with taking them, and the college kids are more interested in making out than doing any research. The group is easy pickings for an undead medicine man named, Tartu, who can change into a tiger, python, shark, alligator, or a slightly more hunky version of himself. As the group gets killed off one by one, they struggle to find the tomb of Tartu and the means to destroy him. 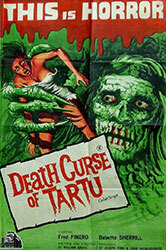 Death Curse of Tartu is a pretty bog (pun intended) standard swamp monster movie . The opening is notable only because once the cowboy is killed, a parchment is taken from him which seems to contain the opening credits for the film. There are a lot of long dull stretches in this movie, but I did find the Everglades setting to be at least somewhat refreshing. I wish the movie would have spent some more time developing the haunted desolation of the swamp, but it was too busy staging animal attacks with stock footage. This movie could be a contender for all-time worst snake attack with an actual snake, as we watch a man roll around with an uninterested python for what seems like ten minutes. There is a momentary bit of surprise gore near the end, but it’s not enough to keep Death Curse of Tartu from limping across the finish line.